Cabernet Sauvignon by St Marys of Coonawarra. House Block Cabernet demonstrates exquisite balance, fine Coonawarra richness persists, sultry aromatics expressing regional mint along with pepper and new leather over olives and graceful vanillan oak culminate on lingering and supportive tannins. St Mary's Winery is situated on a strip of Terra rossa soil, some fifteen kilometres west of the township of Penola. The exclusive little vineyard is sited on part of a grazing propertry that has been owned and operated by the Mulligan family since 1937. Exclusively estate grown Cabernet is harvested for the creation of St Mary's House Block, a wine of overall richness and fine palate structure, dense with varietal fruit character and Coonawarra charm, harmoniously integrated after extended ageing. St Marys is a boutique, family owned, premium red wine producer, sited on some of the Coonawarra's most unique mix of soils. St Mary's winery is situated on a strip of "terra rossa" soil 15 kilometres west of the township of Penola in the southeast end of South Australia. In 1909 the first members of the Mulligan family arrived in the Penola district. The property that St Marys Wines now stands upon was purchased in 1937. This property is 15km west of the town of Penola. Its primary use was for sheep and cattle grazing. Barry and Glenys Mulligan researched the establishment of a vineyard on a 200 acre section of the property in 1984. This part of the property was unique in its elevation the rest of the property but mostly for is soil. The Ridge consists of limestone covered in terra rossa soil. The initial planting of vines began in 1986. Vintage 1990 brought the first harvest for the first ever wines for St Marys. 1992 heralded the opening of the estate's cellar door, as St Mary's commenced distribution of it's wines nationally and internationally. The vines are planted on an elevated area of Terra Rossa soil over Limestone. The soils are generally very stony. 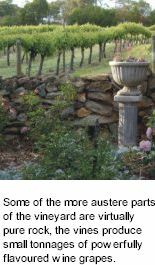 Some of the more austere parts of the vineyard are virtually pure rock. The vines that have survived on these stony areas produce relatively small tonnages compared to local district averages. There is only one basket press on the entire winemaking operation, and all the fruit being pressed through it makes for a softer and more traditional character to the wine. St Mary's quietly prides itself with the knowledge of its high level of environmental responibility. Estate grown grapes only are used in the production of all St Mary's wines. Small batches of hand picked grapes are fermented in open vats, Basket Pressed and barrel matured in climate controlled storage before being bottled on premises. St. Mary’s House Block Cabernet displays the concentrated blackcurrant characters of pure cabernet aromas complemented by cedary oak influence. Typical of the House Block style the wine is rich and full-bodied with ripe cabernet flavours. This wine has the capacity to develop further complexity and classic aged characters. The Super Premium label of St Mary's Wines is the result of each vintages stand-out batches of wine. The wine sports the family name as a statment of pride in its creation. As a wine it has been selected for its prolific fruit character and excellent tannin structure. This wine will age well and with longevity rewards will be reaped. Bells and Whistles is picked from the different blocks at St Marys. Grapes are fermented in the small separate batches as they are picked from the vineyard. 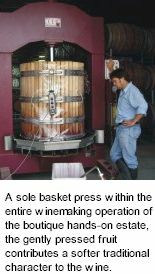 The wine is then extracted from the skins using a basket press. Maturation – 12 months in climate controlled storage. St Mary's Merlot is fermented in small batches then basket pressed, creating a wine of intense varietal character which is then matured for 18 months in French and American oak hogsheads. St Marys Shiraz is enhanced by maturation in American and French oak hogsheads for 15 months. The Shiraz characters to this wine are persistent, with excellent balance of ripe fruit, subtle pepper and soft tannins.